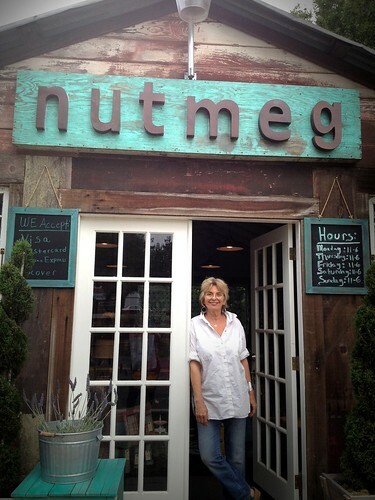 Joanne of the Nutmeg Shop, Nicasio, CA, originally uploaded by cproppe. I had the pleasure of meeting both Joanne Sollecito and Ruby Hackney today in their new "Vintage Farmhouse Chic" shop on the Square in Nicasio, California. Ruby is a mother of two with an amazing design sense and flair for merchandising. 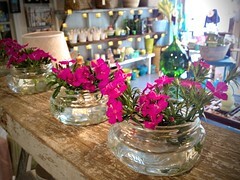 The color spots she had created in the shop were so enjoyable, and the found mason jar flower displays were unique and fun. I loved being there, and didn't want to leave! I was sent to the shop by Liz Daniels, proprietor of Cow Track Ranch, where I had been with the group "Art on the Farm" today for plein air painting. Liz was raving about Ruby and Joanne's place and telling me I should bring my paintings there for them to sell... that would be great! Local art would do very well there, as it is located right next to Druid's Hall where the annual MALT art show and exhibit is held each year. Rancho Nicasio has a series of summer concerts on the lawn that are lots of fun. Joanne and I started talking about coffee on the Square, and how that would be the next shop needed for all the passing summer cyclists. Having just taken a brief nap with the cows myself at Cow Track, as the fog rolled in and it got windy and unpredictably cold, I was definitely ready for my afternoon caffeine assist before driving the winding roads home. Just down the road from Nutmeg is Nicasio Valley Cheese Company and the LaFranchi Ranch, home of the west Marin pumpkin patch. Lucky for me, they were having a special today, 2 for 1 on Foggy Morning and Foggy Morning with Basil... yum! I'm sure it won't be long before the MarinIJ and Marin Magazine snap up the story of this new opening... I suggest they do a "Mother and Daughter" businesses of Nicasio story, since Liz Daniels and daughter, Melissa are now operating a B&B and "Real Weddings" venue at Cow Track. The new website by Melissa is terrific, with lots of photos. Get out and enjoy Nicasio!